Even though baseball is a game, in Cuba it is certainly no child’s play. For us Cubans, a baseball game can destroy a years-old friendship, throw the most blissful marriage into crisis, separate two brothers or create a neighborhood tiff. People can end up hating each other between balls and strikes, between scored or un-scored runs, between strikeouts and homeruns, between great fielding and unexpected errors. And all of this happens because baseball is a passion on this Island and passions turn us into somewhat irrational beings, yet faithful and determined to giving our all to defend what we love. A Cuban can be having a tough time at work, be sick or have some family member in the hospital, but if their baseball team is doing well, this gives Cubans strength of spirit in the hope that, in the long run, everything is going to turn out fine. This sport runs in our blood, just like the need to dance or to eat masas de cerdo fritas–fried pork medallions. Baseball is a spectacle that, without any doubt, surprisingly fits our essential idiosyncrasies. It goes hand in glove with controversy and leisure time, both of which practices seem to fascinate us. Baseball connects us with each other like nothing else can. When baseball is on the table, Cubans are spontaneous and carefree, like in the good old days. On any corner, in any park, avenue or entrance to a store, even in a hospital, people impulsively and light-heartedly discuss last night’s game. The most attractive feature of this is that a baseball game doesn’t end with the final strike; it sometimes (or almost always) manages to go on for days in the discussions of fans who come across as true experts. Deeply ingrained in the lives of Cubans, baseball cannot be set apart from our creative universe. Like a powerful fuel that revs up the imagination, various artists have interpreted it through different manifestations. However, visual arts seem to have taken up their position in the forefront–once again–especially in the way they have adopted the codes and mythology of baseball, to provide a convincing visual solution through a product that possesses undeniable esthetic values. At a difficult time for our society, it was the visual artists who were the greatest promoters of an event that ended up becoming a referential work for Cuban art: El juego de béisbol (The Baseball Game). 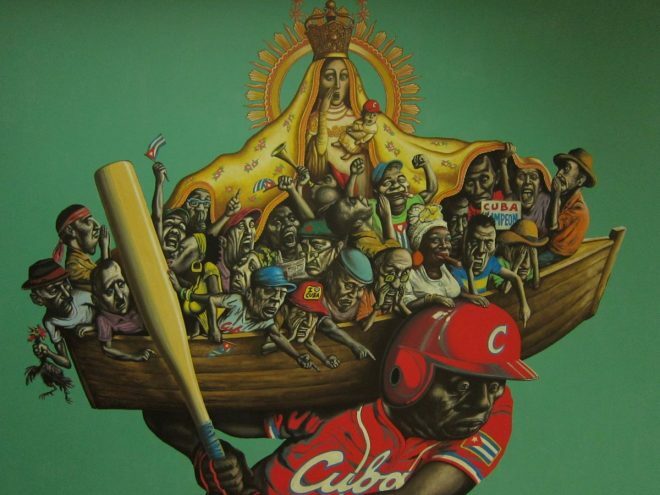 This year of 2013, which has seen the celebration of the Third World Baseball Classic, a remarkable group of artists gave free rein to their affection for baseball in the exhibition entitled “Clásicos del Béisbol en Cuba” (Baseball Classics in Cuba), at the Fresa y Chocolate Gallery from March 1 to 19. This singular exhibition included works by widely acknowledged artists, belonging to several generations, such as Arles del Río, Reinier Leyva Novo, Raynerio Tamayo, Rubén Alpizar, Douglas Pérez and Frank Martínez. Clásicos del Béisbol en Cuba surprises for its extraordinary spirit of reflection, capable of surpassing the limits of the subject matter per se and delving into the problems of life in Cuba using the excuse, or inspiration, of the balls-and-strikes pastime. Elements such as elegant irony and philosophical humor have not been overlooked; in fact, they abound, along with double entendres, all valid weapons working together to revolutionize the state of mind and propose novel interpretations of reality. Even though the majority of pieces at the Clásicos del Béisbol en Cuba show are paintings and drawings, the installation entitled A chocar la bola (Hitting the Ball) by Yuniet Hernández attracts a lot of attention. Using different baseball bat inventions, the artist dialogues about the Cuban character and the manner in which we interpret religion, science, sexuality and other topics. Other works are outstanding for their formal and ethical consistency: El cuarto Bate (The Fourth Bat) by Reynerio Tamayo, Otra manera de superar los límites (Another Way of Going Over the Limits) by Frank Martínez and Esperando que caigan las cosas del cielo, o el deporte nacional (Waiting for Things to Fall From the Sky, or the National Sport) by Arles del Río. These pieces are lucid metaphors that synthesize the efficacy of this pictorial gift that has arrived just about at the same time as spring.